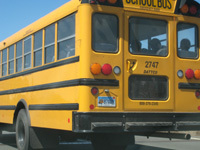 These plates are issued to school buses. This type started in 1993 or 1994. Prior to this, school buses used Serv. Bus plates. The graphic on these plates made them an immediate hit with collectors. The original series was 12'S'34. After 99S99 came 12A34, sometime in mid-late 2001. Today plates are in the 12B34 series. There are also less common "School/Livery Bus" plates, similar in design, in a 1'SL'23 format. 2002 After 99S99 came 12A34.